Burkina Faso is a landlocked country on the Northern border with Ghana. Burkinabees as they are known, are a friendly and colourfully dressed people. Burkina Faso actually means “land of the upright man”. However Burkina Faso is a very poor country and as a result has the worst literacy rate on the planet. In 2015 it was estimated that less than 36% of over 15 year olds can read and write. If you focus on just the women over this age the figure is below 30% due to gender inequality in this country. The infant mortality rate is also one of the highest globally; there is an average of 64 deaths per 1,000 live births. In the rural areas of Burkina Faso these figures are estimated to be far higher due to huge distances to schools and hospitals as well as a vast lack of income. Nearly half of the population is considered to be living in extreme poverty. We have partnered with Burkina Faso for more than 10 years, launching and supporting several development projects in the rural areas around Bobo Dioulasso. Through a secondary school and a thriving medical centre we are meeting the needs of hundreds, providing affordable healthcare and education. 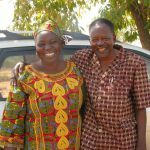 Jean had the vision to start a work in the rapidly growing city of Bobo Dioulasso in 2006 , the work now encompasses a medical centre and two schools that serve the local families who have migrated into the area. Jean studied theology in the UK before returning to work as a pastor in Burkina Faso and then starting International Needs. Jean and his wife are grandparents and have four children and three grandchildren.